Food insecurity is defined by the United States Department of Agriculture as having limited access to enough nutritious food to live a healthy lifestyle. In 2015, 8.1% of seniors age 60 and older in the U.S., or 5.4 million seniors overall, were food insecure. This represents a slight drop since 2014, down from 8.8% and 5.7 million seniors. However, the current rate of food insecurity among seniors remains substantially above the rate in 2007 (6.3%), and the current number of seniors who are food insecure is still more than double the number in 2001 (2.3 million). 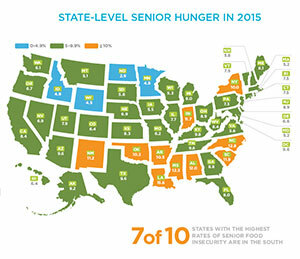 The report, The State of Senior Hunger in America in 2015, provides an overview of the extent and distribution of food insecurity in 2015 among seniors in the United States, along with trends over the past decade using national and state-level data, quantifying the senior population facing the threat of hunger (i.e. marginally food insecure). 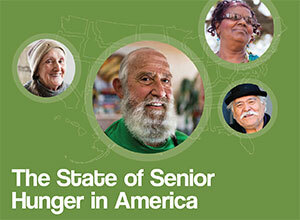 Additional information provided in a supplement to this report also presents evidence on seniors at risk of hunger (i.e. food nsecure) and on seniors facing hunger (i.e. very low food secure). One quarter (25.1%) of seniors with a disability are food insecure. Seniors who live with grandchildren are more likely to be food insecure than seniors who do not. 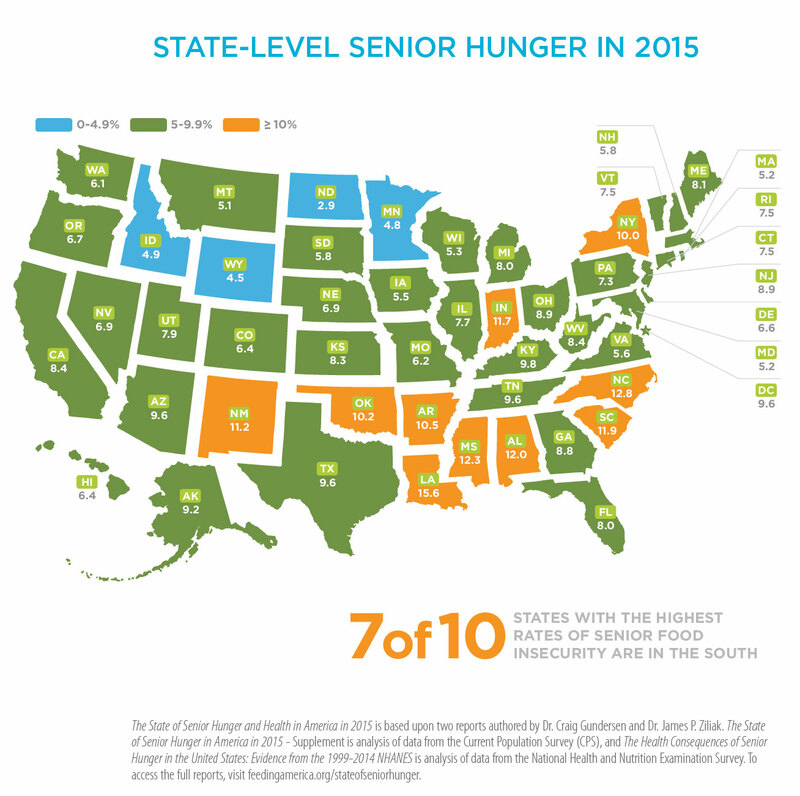 Continuing with historic trends documented, this report finds that the threat of hunger is greatest among those living in states in the South and Southwest, those who are racial or ethnic minorities, those with lower incomes, and those who are younger (ages 60-69). The majority (65.8%) of seniors who are food insecure have incomes above the federal poverty line ($11,770 for a household of one in 2015). Despite an improving economy and financial markets, millions of seniors in the United States are going without enough food due to economic constraints. Based on the findings regarding food insecurity and health in Gundersen and Ziliak (2017), this stubbornly high proportion of food insecure seniors continues to impose a major health care challenge in the U.S. In fact, food insecurity among seniors age 60 years and older is associated with 11 adverse health conditions. And, it is most strongly associated with depression – food-insecure seniors are 78% more likely to experience depression than food-secure seniors. One of the more consistent messages that you will hear during an election cycle is the question of how we are leaving our economy for our children. Will they be better off than we have been in our professional careers? But, what about the future of those who have gone before us? What opportunities or challenges do they face after paving the way for our progress? We live in a nation that has a food insecurity rate for seniors of over 8%, that translates to 1 in 12 or the equivalent of 5.4 million people! These numbers were gathered for calendar year 2015, which is the most current data available. For our society, this senior segment represents those who came before us, provided for us and helped to shape us into what we are today. 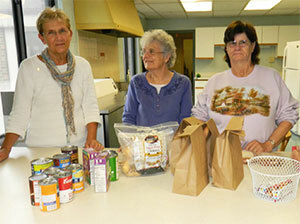 Indiana ranks in the top ten among states for the percentage of senior citizens that are food insecure. For seniors, food insecurity can be even more challenging as we consider the strong link between food insecurity and overall health. Thankfully, we have seen more programs initiated locally in the last two years with a focus on providing food assistance to our senior population. These programs get nutritious food to people who don’t have the ability to get food without assistance. Inside this edition of Serving the Hungry you will read about the state of senior hunger in our country and learn more about the programs we support in an effort to reduce this rate. We hope that this information will allow you to be more informed and helpful when you encounter someone in need. There really is no reason someone in our country – or for that matter in our great state of Indiana – to ever go without a meal when we have so much food readily available. 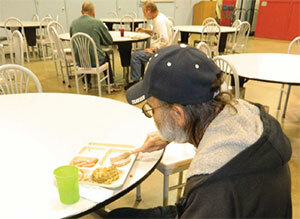 Each weekday, the Fishes and Loaves Soup Kitchen is open for lunch in the dining room at Ryves Youth Center. An average of 80 people come to get a warm meal, sit at tables in the dining room and often stay around to talk with friends that they have made in the neighborhood or at the lunch itself. But Naomi Smith, Food Service Coordinator, notices something particular when she serves her customers. Many are older. They often comment that lunch is the highlight of their day. They like what they consider “home cooked” meals; home-style like mashed potatoes and gravy or turkey and stuffing. It reminds them of home and being in a family. In addition to the meals, it is these sentiments that are heartwarming. Naomi has come to know her “family.” She knows that many suffer from high blood pressure or diabetes due to a lifetime of poor nutrition. Therefore, she pays attention to the amount of salt and sugar in her meals. Though the tea is sweet, it is not too sweet. People first come to the Soup Kitchen for a nutritious meal, but why do they keep coming back? It’s for more than just a meal. Jack Meany, Harry and Rosaline Secrest and Karen Goehl have focused their efforts on fundraising and gathering nutritious foods to meet the needs of these neighbors. The volunteers and committee members of the program are fighting food insecurity one can of soup and brown bag at a time. Last June, the Brown Bag Lunch committee members, volunteers, staff, and Garfield Towers/Warren Village residents celebrated the one-year anniversary of the program with a luncheon. Over 80 individuals came to celebrate not just for the food but for the relationships that they had discovered during that time. We are grateful there are people like Jack, Harry, Rosaline and Karen who see a need and are willing to do something that makes a difference.